From the monthly archives: "June 2008"
Photography BLOG have reviewed the new 8 megapixel Nikon Coolpix P60 – it’s part of their “Peformance” range – it features a 5x optical zoom lens with optical image stabilisation, a 2.5″ screen, and is available in Black for £144. 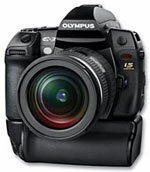 Buy-n-shoot have published a review of the new top of the range E-3 professional Olympus Digital SLR – the camera features a 10 megapixel LiveMOS / Live view sensor, “World’s fastest autofocus* for quick and precise image capture”, 5fps sequential shooting with 19 image RAW buffer, built-in image stabiliser, 2.5″ swivel screen, Shadow Adjustment Technology, dust reduction system (Supersonic Wave Filter), Splashproof body and lens system, High sensitivity (ISO 100-3200), and 11 point AF. The E-3 is available for £945. Olympus EVOLT E-3 DSLR at Focus on Imaging 2008. Canon Powershot A590 IS Review Online! We’ve just published our review of the new Canon Powershot A590 IS – like the A580 it features an 8 megapixel sensor, 4x optical zoom lens, 2.5″ screen, face detection focus, and takes AA batteries – but adds full manual controls, support for optional lens accessories, and optical image stabilisation. The A590 is available for £112 making it the cheapest Canon available with optical image stabilisation, and possibly one of the best budget cameras of 2008 so far. DCResource have reviewed the new Canon EOS 450D / Digital Rebel XSi – a 12.2 megapixel update to the 400D – it features 3.5fps shooting, live view shooting, 9 point AF, 3″ screen, SD memory card support, and Canon’s dust reduction system. 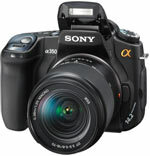 The 450D Body only is priced at £429, the EOS 450D with 18-55mm IS kit is £473. View our Canon EOS 450D DSLR Hands-on at Focus. Photography BLOG have reviewed the new 12 megapixel Ricoh GX200 – it features a wide angle 24mm 3x optical zoom lens, vibration correction, 1cm macro, ISO1600, and a 2.7″ screen. The GX200 with electronic viewﬁnder included, is available for £399, the GX200 Standard will be available for £349.